The Samsung S Pen does more than help you tap commands on the screen. In fact, the S Pen is now so capable that you'd be forgiven for not knowing all it can do. Learn about the best uses for the Samsung stylus to get the most out of your Galaxy Note. 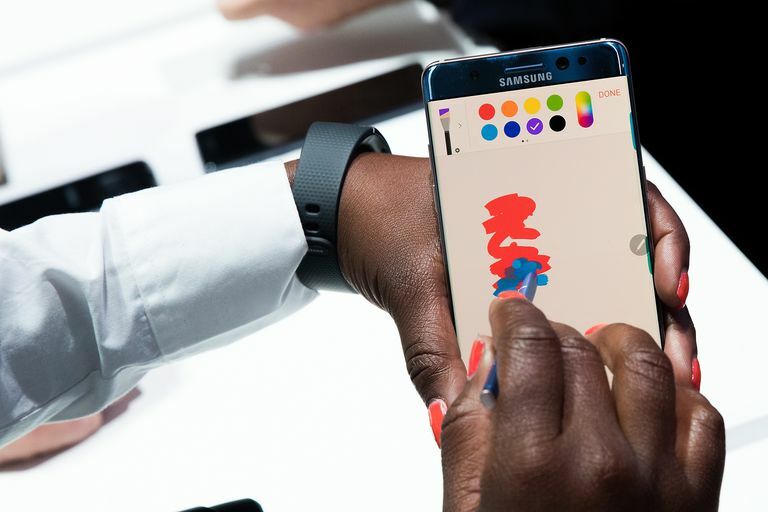 Instructions in this article apply to the default stylus that ships with all Samsung Galaxy Note devices, but some features are only available on Galaxy Note 9, 8, and 7 models. Tap the Air Command icon that appears on the right side of your screen when you remove the S Pen. You'll notice that button won't work with your finger. You must use the S Pen to tap it. Tap the gear icon on the Air Command menu to open Settings. Scroll to the Removal section of the menu that appears, then use your S Pen to tap When S Pen is removed. The next time you pull out your S Pen, the Air Command menu will automatically open. You can also press and hold the button on the side of the S Pen while hovering the tip of your pen over the screen to open the menu. You can enable additional apps by tapping the plus sign (+) on the Air Command menu. Scroll through those apps by drawing a curved line around the Air Command icon. You can also press and hold the Air Command icon with the tip of your S Pen until it darkens to move it around the screen and change its default location. With Screen Off Memo enabled, you don't need to unlock your device to make a quick note. Simply remove the S Pen from its slot. The Screen Off Memo app launches automatically, and you can begin writing on the screen. When you're finished, press the Home button and your memo is saved to Samsung Notes. Tap the Air Command icon with your S Pen. Select the Settings icon in the bottom-left corner of the screen. Toggle on Screen off memo. Pen: Change the line thickness on the pen tip. Eraser: Select to erase anything on the note you're creating. Push Pin: Tap to pin the note to your Always On Display. Using this feature, you can draw create cool GIFs to share with your friends. To use Live Messages, tap the Air Command icon with your S Pen and select Live message. Pen effects: Choose a regular line, a shiny line, or a glowy line. Pen size: Change the width of your pen line. Color: Choose the color you want to use for the pen ink. You can also change from a solid color background to a photo by tapping Background. Select one of several solid colors, or choose an image from your photo gallery. When you select Translate from the Air Command menu, you can then hover your Samsung stylus over a word to translate it from one language to another. This is useful if you're looking at a website or document that's in another language. You can also use it to translate from your native language into a language you're trying to learn (English to Spanish or from Spanish to English, for example). When you hover your pen over the word to see the translation, you'll also have the option of hearing the word in spoken form. To hear it spoken, just tap the small speaker icon next to the translation. Tapping the translated word will also take you to Google Translates where you can learn more about the word usage. When using the S Pen, surfing the web is much easier, especially when you encounter a web site that doesn't render well in mobile format. To highlight a word or phrase, just press the tip of the S Pen to the screen. Then, as you drag the pen, you can copy and paste as you would with a mouse. You can also right click by pushing the button on the side of the S Pen while you perform an action. Instead of using the mobile version of a website, choose to view the desktop version of the site and use your S Pen in place of a cursor for a smoother experience. Sometimes looking at things on a small screen can be difficult. If you want to look closer, you can pinch to expand the page, or do it the easier way. Select Magnify from the Air Command menu to use your S Pen as a magnifier. When you open it, you'll find controls in the upper-right that allow you to increase the magnification. When you're done, just tap the X to close the magnifier. Glance is a neat feature that lets you move back and forth between apps with ease. When you tap Glance in the Air Command menu from an open app, that app becomes a small screen down in the bottom-right corner. When you want to see that app again, hover your pen over the small screen. It increases to full size and will drop back down again when you move your S Pen. When you're done, just press and hold the icon until the trashcan appears, then drag it into the trash. Your app will remain where it should be; only the preview is gone. From any app or document on your device, use your S Pen to select Screen Write from the Air Command menu. A screenshot is automatically snapped of the page you're on. It opens in an editing window so that you can write on the image using several options for pens, ink colors, and cropping. When you're done, share the image or save it to your device. If you're a fan of animated GIFs, then Smart Select is the capability you'll love the most. Choose Smart Select from the Air Command menu from any screen to capture a portion of that page as a rectangle, lasso, oval, or animation. Choose the option you want, but animation only works with video. When you're done, save or share your capture. End the app by pressing X in the upper-right corner. You can write directly into a document or text field by choosing the Pen option within the document. There are dozens of great apps out there that you can write or doodle in with your S Pen such as journals, coloring books, and much more. New apps are introduced on a regular basis to take advantage of the S Pen's capabilities.